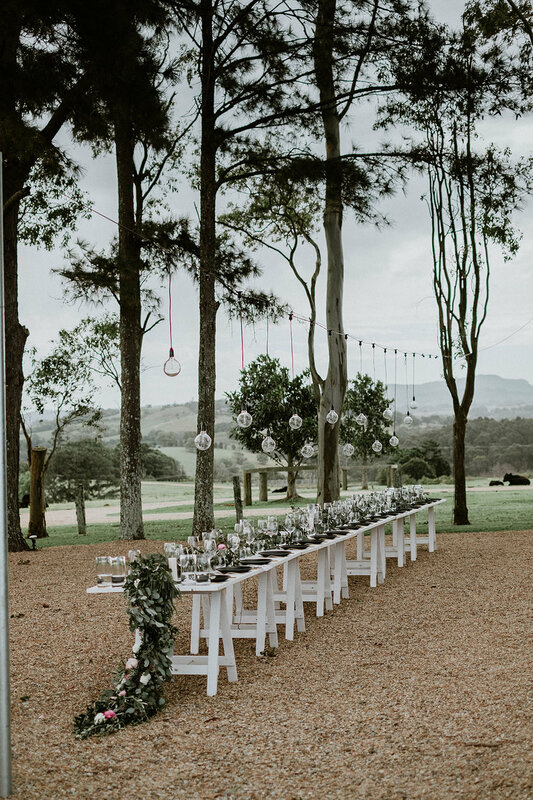 Here at The Wedding Shed our job is to make weddings in Byron Bay as beautiful, stylish, sophisticated, on-trend and unique as possible. One of the simplest and most effective ways we do this? Creating a bespoke styled tablescape for your reception. 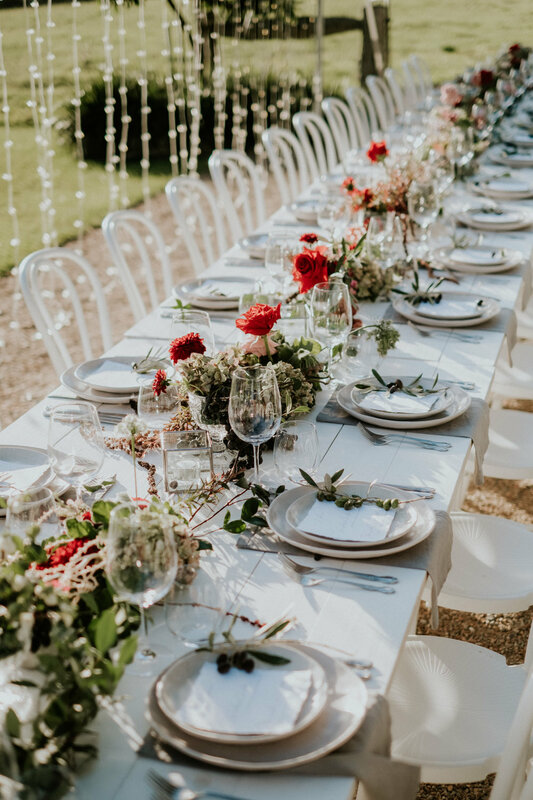 Our team of expert stylists, a region of awe-inspiring venues and one massive shed full of incredible wedding furniture and furnishings - each contribute in manifesting a totally flawless set-up. 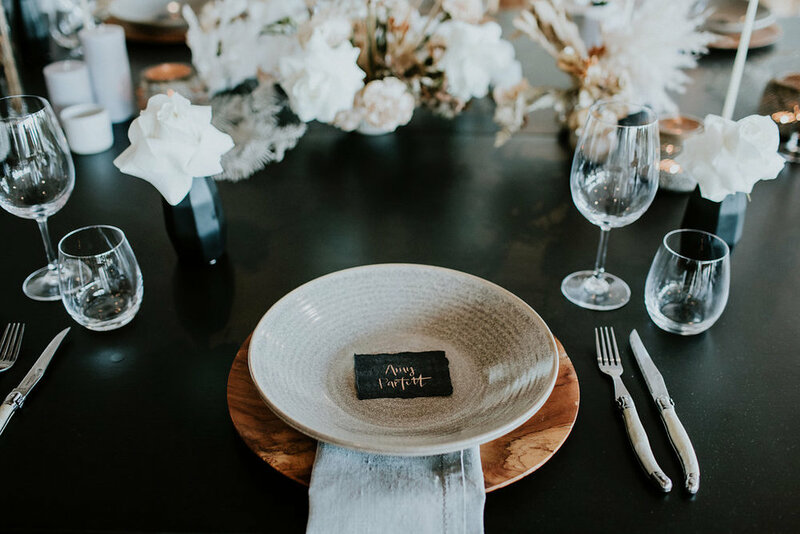 We’ve narrowed down 18 of our most favourite tablescapes from our real weddings and styled shoots to simply inspire you. As well, we want to share with you a few simple tips and tricks of the trade to add that WOW factor…. easily. To create a visually interesting table setting it’s important to be conscious of incorporating different textures. For your main textures and colours, consider softer elements of natural linens such as a table cloth, runner, napkin or silk ribbons. Go for more of a statement texture at the base layer with your charger plate; think raffia , timber or rattan to tie in with the theme. We love playing with a variety of widths, colours and finishes. When styling a wedding it is all about telling a story, and this comes through by adding those personal touches with the little details. 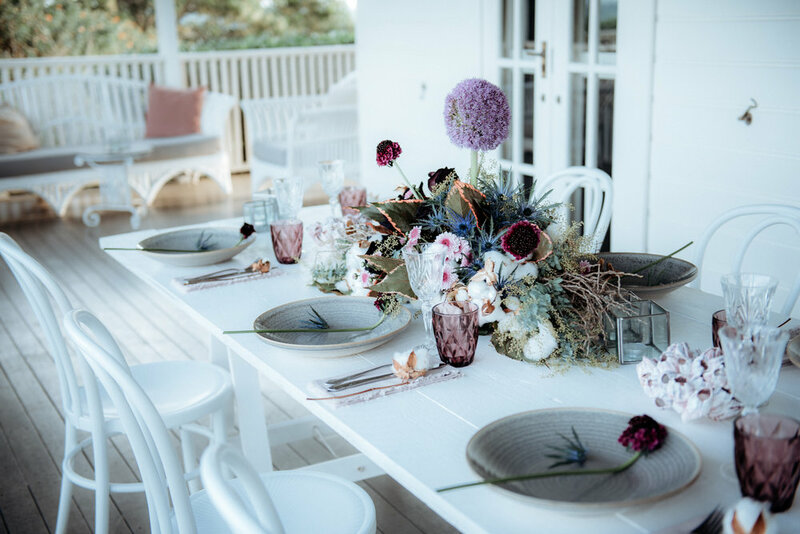 Table decor is the perfect place to infuse a little bit of your own personal style and design that is truly you and can be a talking point with your guests. This flair may shine through in your colours, blooms, cutlery, simplicity or your guest favours. Florals also add colour to enhance the theme and complement the setting. These can vary from an abundance of wild and loose blooms trailing over the table or hanging above the table as an installation with themed lighting. You can work with different sizes of arrangements set within the table to create a statement too. The important note is to keep the details consistent and pay attention to composition. In terms of playing with height, this can be achieved through candle choices, opting for a selection of three different sizes to really create that effect, and grouping them together in clusters. 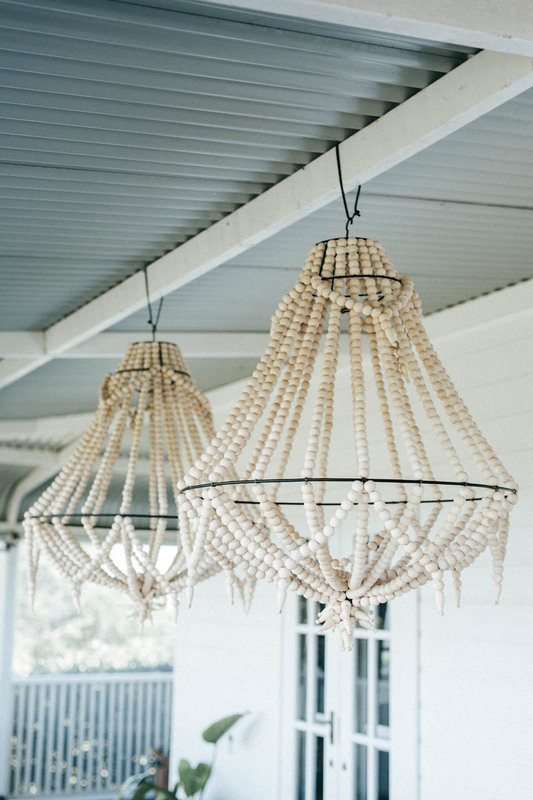 These can create an abundance of glowing light and ambience to add to the atmosphere. 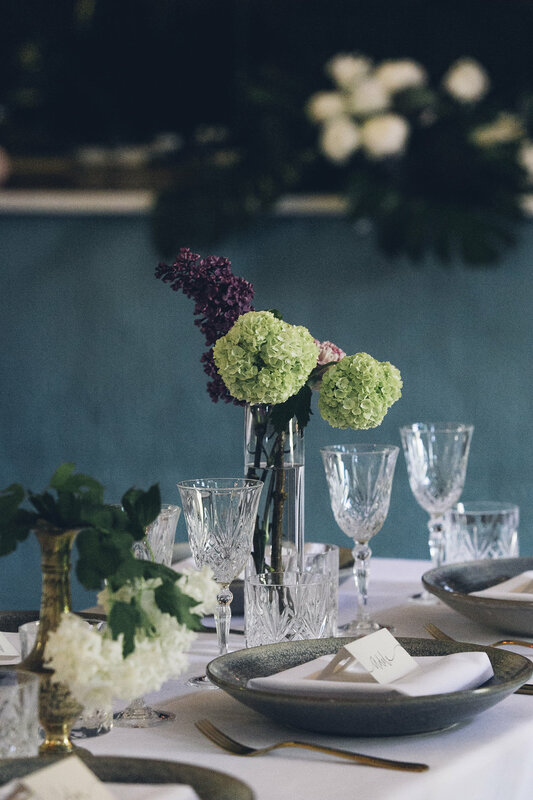 Your tablescape should be consistent with the rest of your wedding styling. Already knuckled down a few things like your ceremony set-up, stationery or perhaps fallen in love with a few furniture items? Then great, you’re almost there! 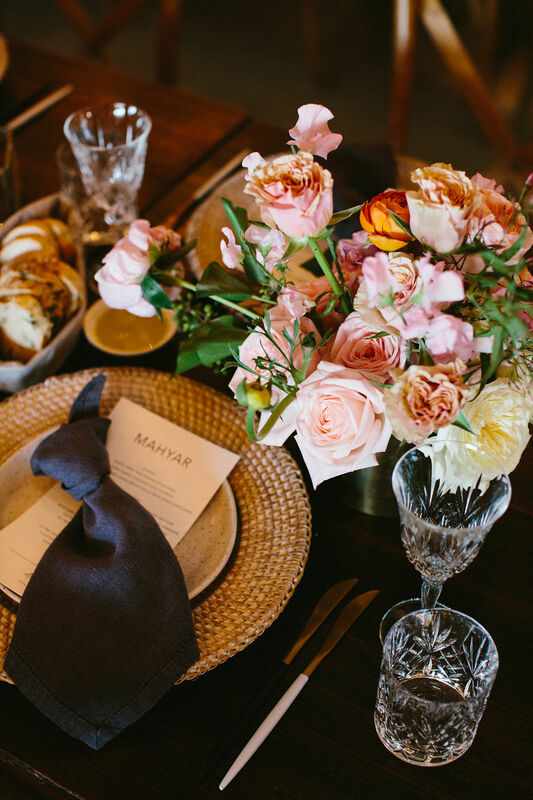 Your tablescape is merely drawing on the details of these things and bringing them together. Consider the composition of your styling here too - is it busy and colourful? Neutral shades with a mix of metallic finishes? Pinpoint your styling formula and rest is a piece of cake. Adding layers is our foolproof go-to for complementing your styling vision with depth. Layers, in hand with textures will create fullness and simply complete the look. If you don’t know where to start, strip it back to the type of table you are going with - consider it’s colour and texture. 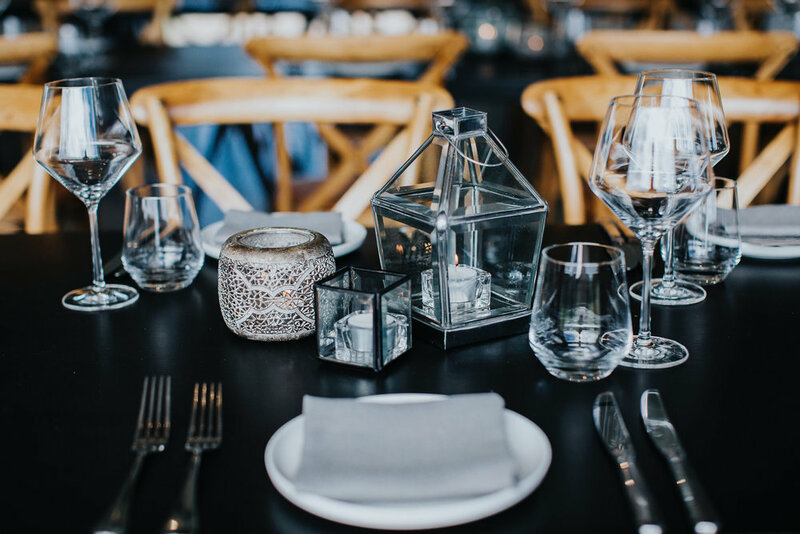 From there, start looking at your charger plates, dinner plates, linen napkins, cutlery, glassware, centrepieces, florals, menu design and personal touches. If you’re yet to establish the styling of the other areas for your wedding, you may be at a loss for not knowing where to start with your colour palette. Begin by simply identifying what colours you like - light, dark, vibrant or neutral? Play it safe by picking one colour you have always loved or perhaps trending at the moment and then match it with tones to complement. Don’t forget to take into consideration your environment - draw on the colours of your venue and seasons. If it’s indoors, are you working with a white canvas or a bold backdrop? If it’s outdoors - are you surrounded by lush greenery or colourful gardens? Work this into your decision making and remember you can always speak with your florist for more inspiration! Agate crystal place names, personalised favours, an olive sprig, feathers or a single bloom, handmade paper stationery …. a sprinkle of sparkle … the choices are endless. We’re kicking off the new year with a reflection of our most beautiful wedding ceremonies of 2018! 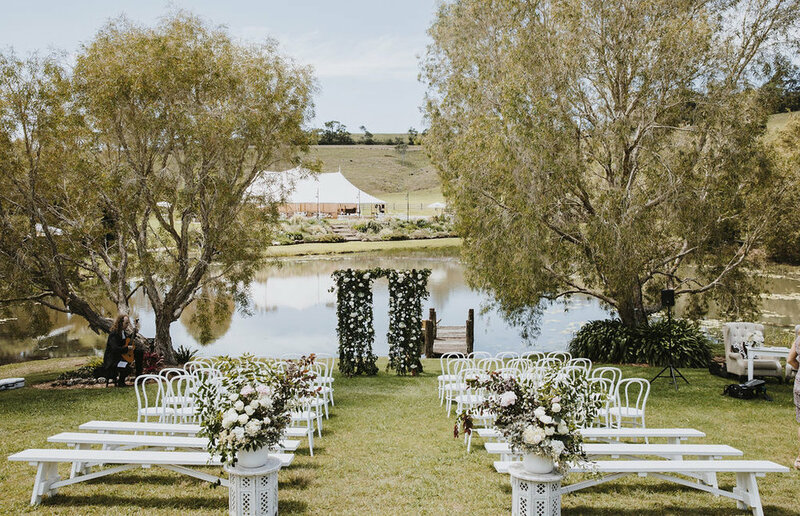 Last year we saw ceremony styles to die for, new arbour shapes, natural designs, signing tables to swoon over and arch ways that enhance the beautiful landscape that surrounds the Byron Bay region. A popular trend in 2018 was triangular wedding arbours. Load them with Pampas and natural florals, they can create an outstanding yet simplistic backdrop. 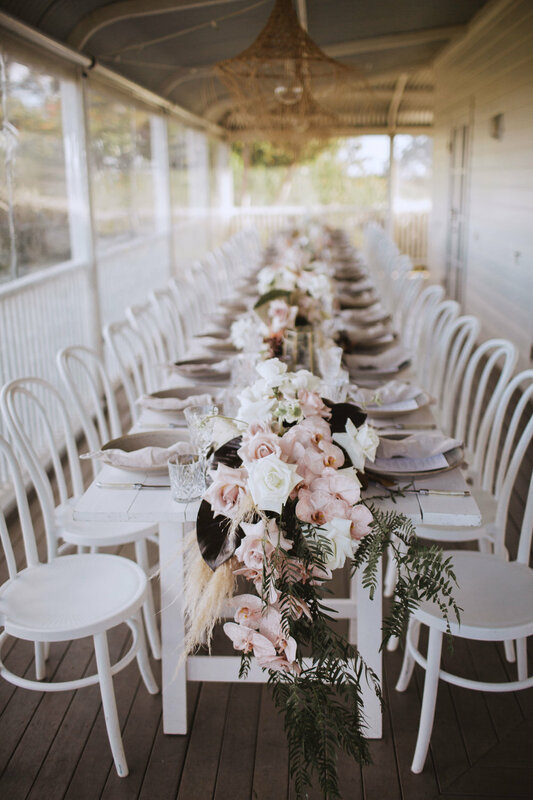 Here we’ve used neutral draping fabric on our whitewash structure matched with our white bentwood chairs to create a classic romantic look at Byron View Farm. Putting structures aside, we’ve seen breathtaking floral statements taking the limelight in ceremony styling. 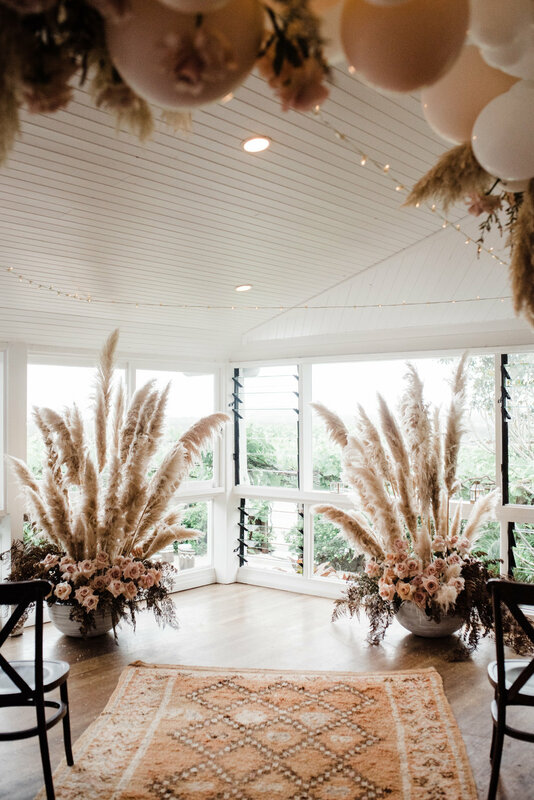 Pampas Grass being one of the trending botanicals of the year alongside dried palms mixed with dusky florals. 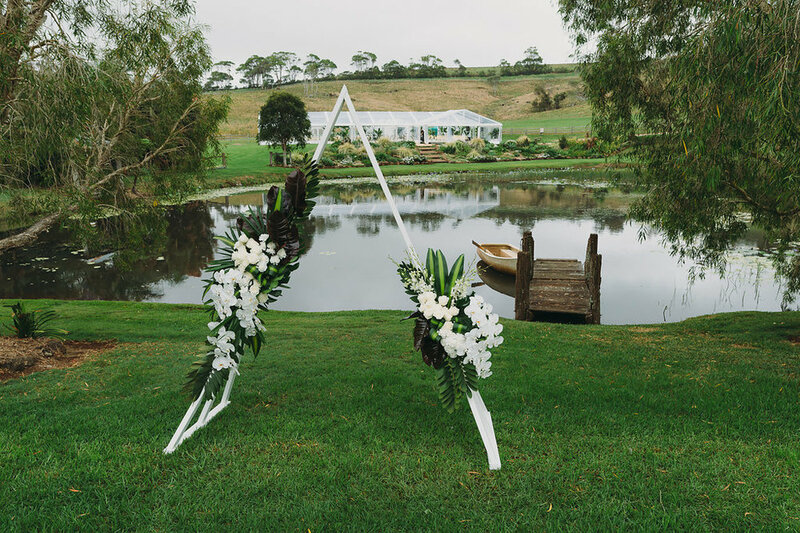 Something truly unique and not compromising on the view was this beautifully romantic hanging floral feature by Alstonville Florist. We are so in love with our Lattice Arbours and how many variations there are to styling them. 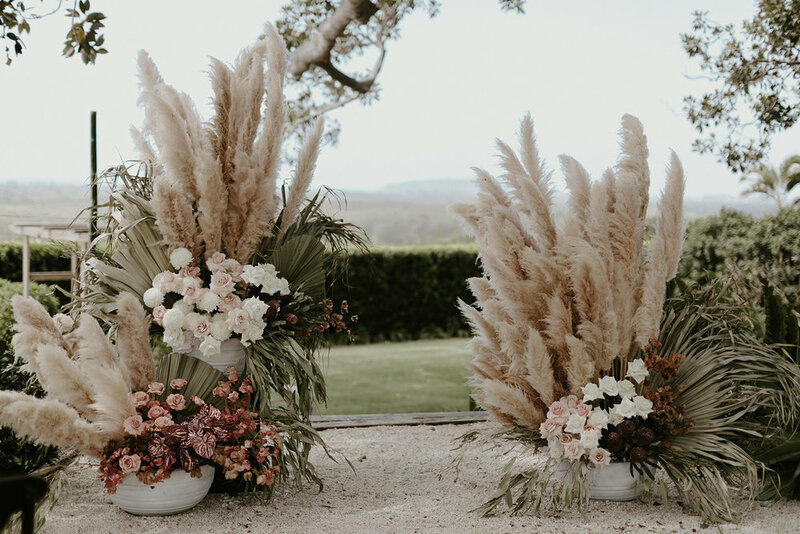 From rich minimal florals to oodles of pampas and palms, they’re way up there in our top ceremony styling props of the year and we cannot wait to see 2019 floral trends cover them in more loveliness. 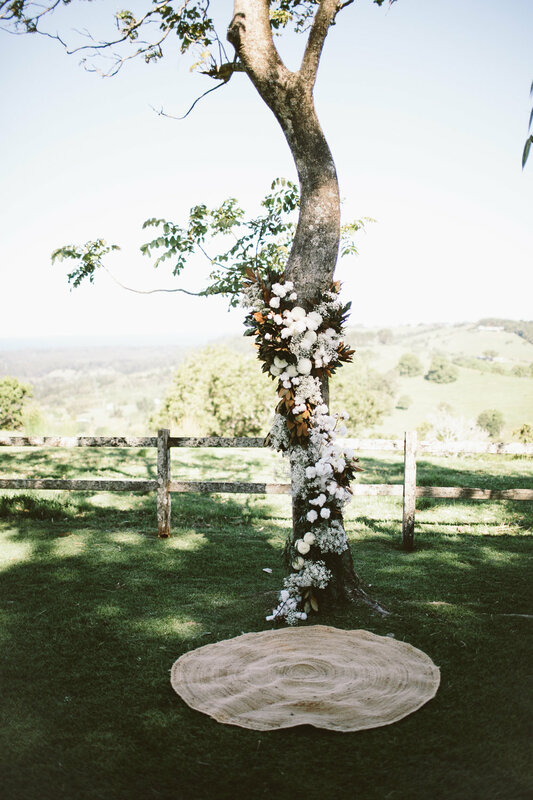 One of the best ways to frame the wonderful view over Byron Bay is to place it in a dreamy round hoop covered in dried botanicals or florals. This romantic round revelation fits perfectly in its natural surroundings at the Fig Tree. You still can't beat the timeless rectangular Hardwood Arbor. You can adorn them with whatever lush or simplistic florals as you like and they work perfectly with any chair choice. Our Gold arbour always creates a statement, dress with as much or little florals as you desire and it still looks amazing! Check out our full range of ceremony styling items such as arbours, backdrops, chairs and signing tables here. 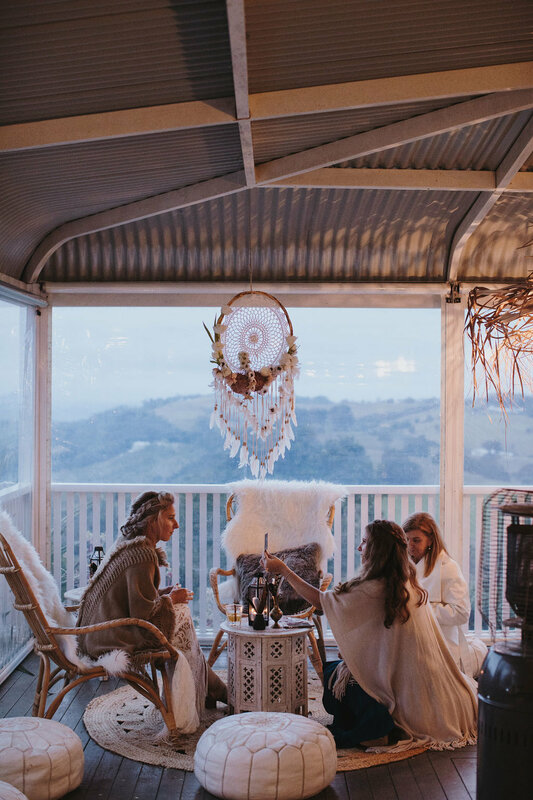 We loved being a part of Emma and Reece's beautiful elopement with Elope Byron Bay earlier this year and being able to create an intimate and unique space and wedding experience to remember. Featuring cosy cocktail corners, dream catchers, dried palms and natural dinnerware, the set up was a perfect design for a couple after a private and personalised day. 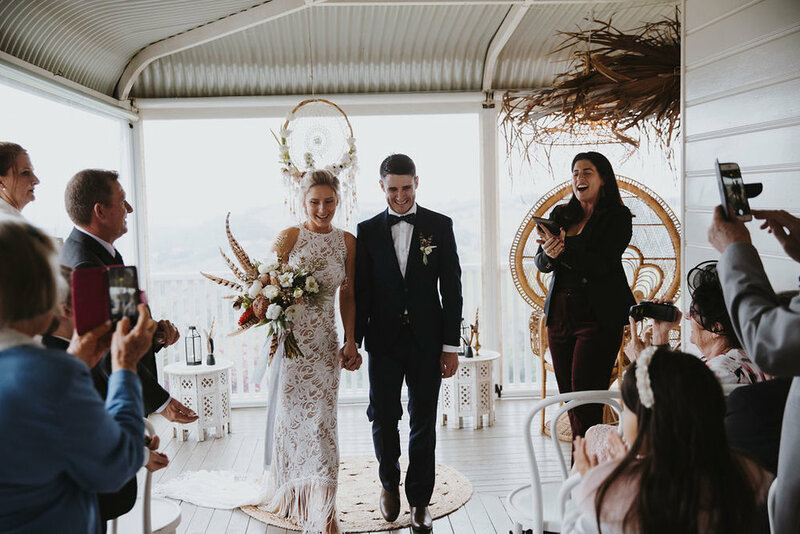 Emma and Reece held their wedding at Byron View Farm utilising the spacious verandah that offers some of pristine views of Byron Bay. 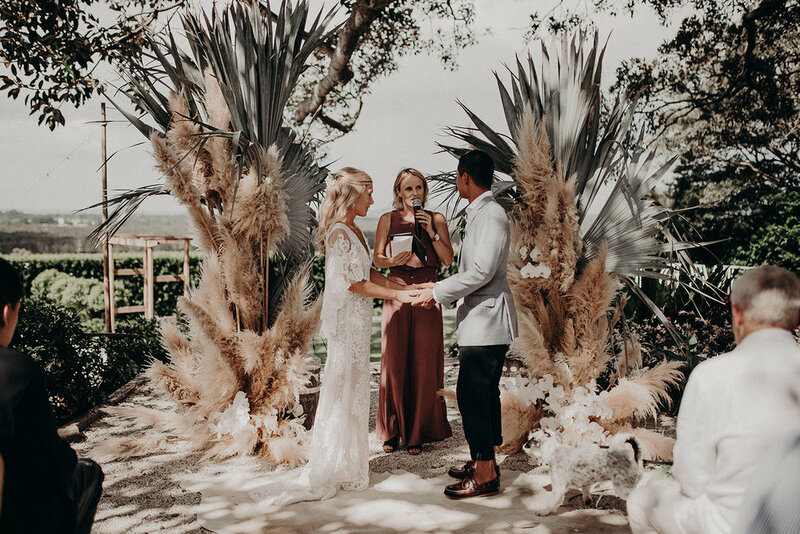 With an intimate setup for their cherished day, the space was filled with a Bohemian vibe of natural textures, and a monochromatic palette and earthy hues that complimented the venue. 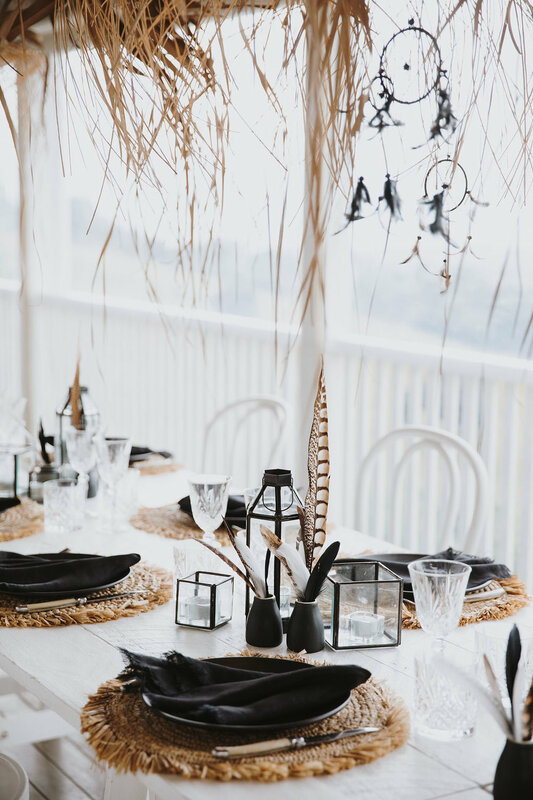 For the tables cape, our White Bentwood Chairs and White Rustic Trestles were set and dressed with Raffia place mats, Black linen napkins, Laguiole cutlery, and feather details. To accompany the dinnerware, crystal cut glasses, and black lanterns were incorporated to complete the table styling. 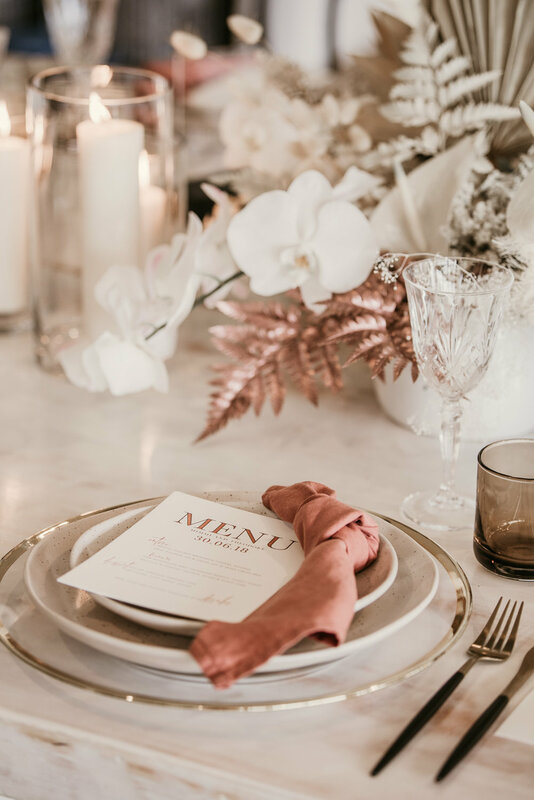 Recent styling has seen a change in trends where place settings become the statement of the table as opposed to central decor and featured table florals. Instead we’re seeing layered settings and earthy features which include a charger plate, main and entree plate, textured napkin, simplistic stationery and unique cutlery. 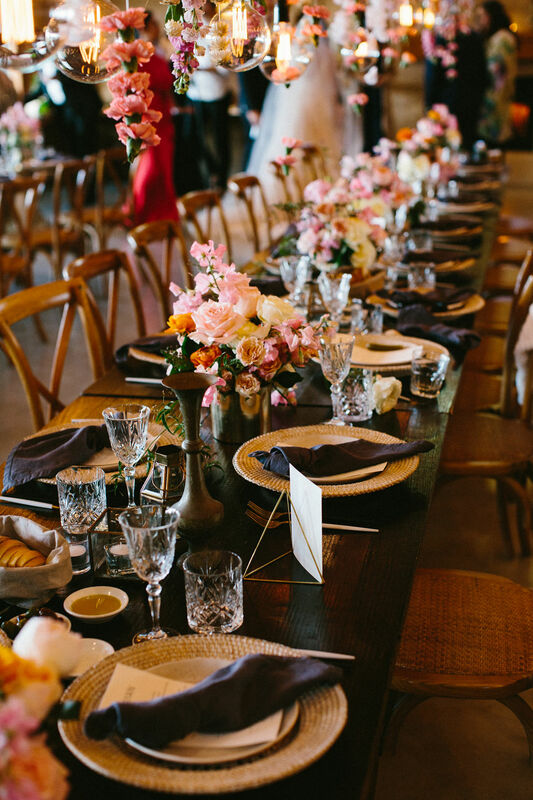 By focusing more on the place settings as apposed to central floral styling in the middle of the table, the floral focus can be created above the table and be more of a statement. Structural dried palms and botanicals can be used and the different heights, layers and textures of the overall styling creates a dynamic look that is a real treat to the eye. 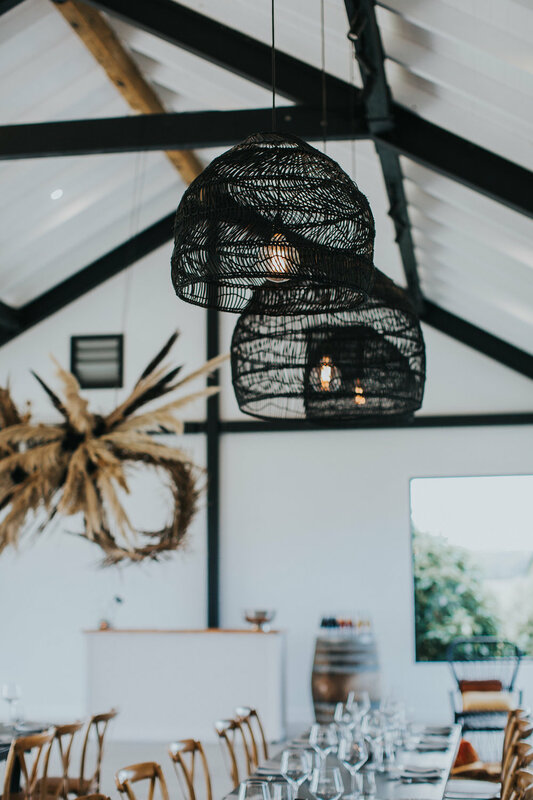 Hanging installations are the perfect way to make a statement to your reception area and can help pull your wedding design together to fill and enhance the space. 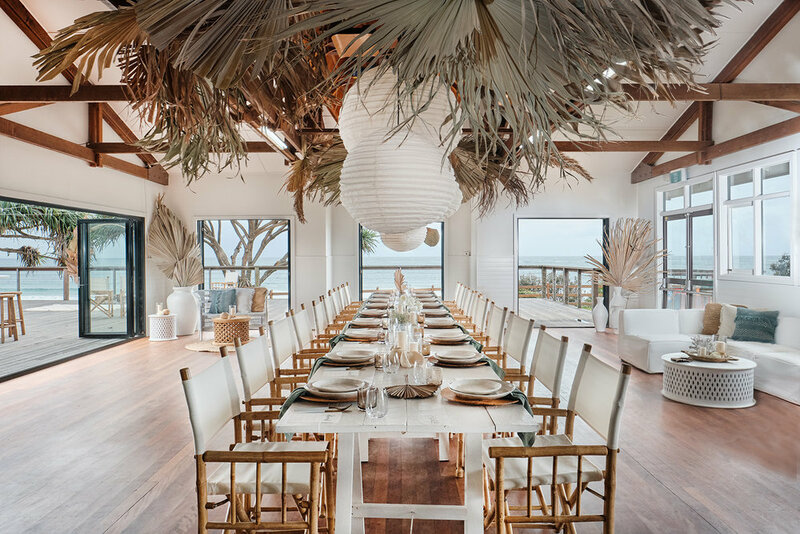 For Emma and Reece’s hanging decor, The French Petal hung dried palms and florals entwined with our Mykonos Pendant lights above the dining area. Other hanging features included a beautiful lace Dream Catcher Wall to accompany another detailed dream catcher to decorate the ceremony area. A simplistic yet stylish setup was perfect for the intimate ceremony of Emma and Reece. 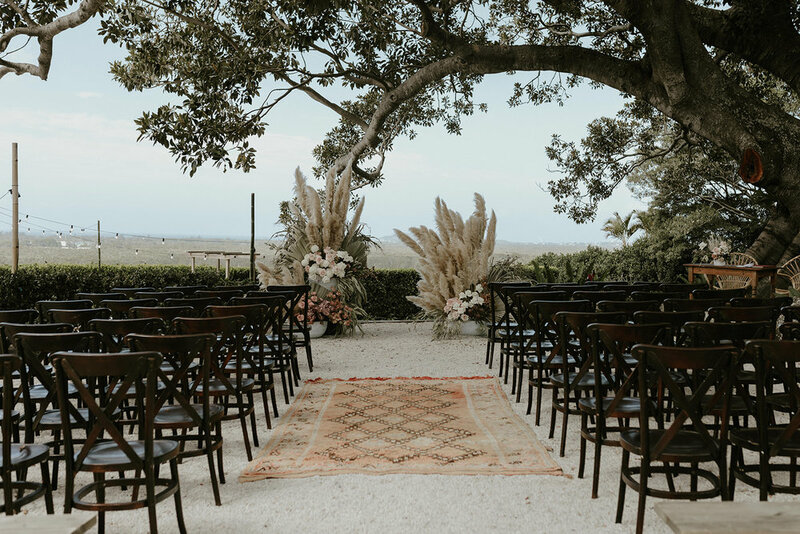 The ceremony area was simple and featured a beautiful hanging dream catcher and our Round Jute Daisy rug. Framing the ceremony were two white boho tables dressed with black lanterns and feathered details to theme back with the dining styling. Emma and Reece’s signing area we used our classic Natural Peacock Chairs the perfect statement piece in keeping with the Bohemian look and complimented the natural textures in their styling. Every celebration should have a cocktail hour to remember. Cozy areas for you and your guests to enjoy can be the highlight of the day! 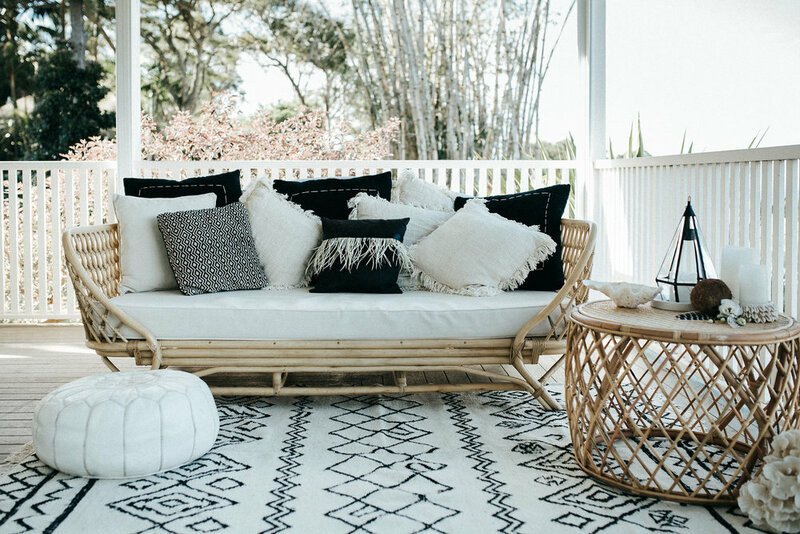 We set up an intimate corner on the deck featuring our Natural rattan relaxer chairs, Moroccan white ottomans, Sheepskin throws, Round jute daisy rug and White boho tables. 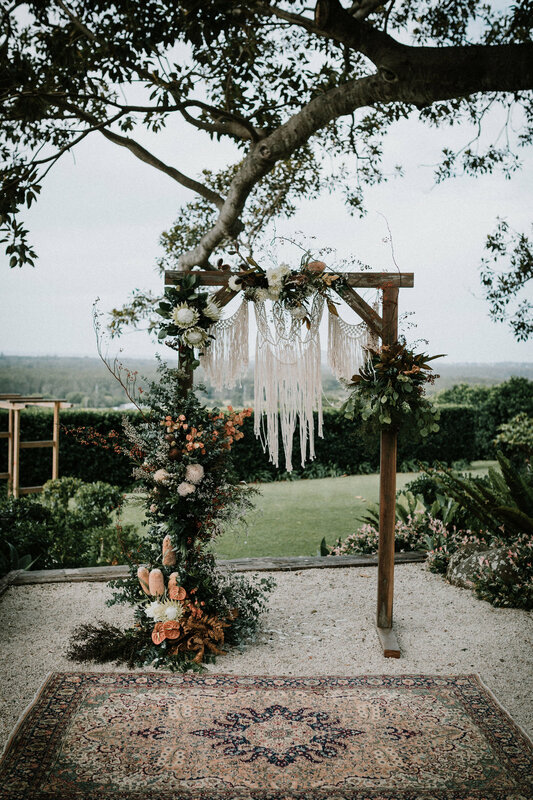 The 7th annual Byron Bay Wedding Fair on Saturday June 30 was a HUGE success and as always invited the opportunity for us to push the boundaries in the realm wedding styling. 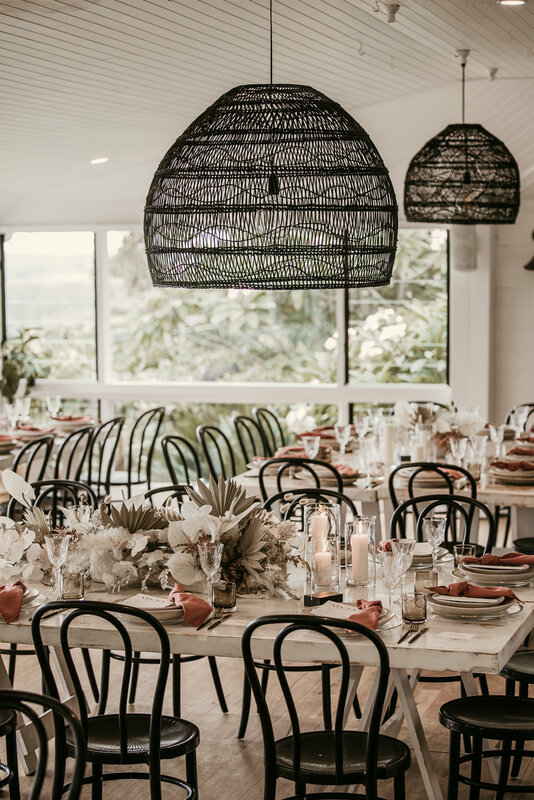 The Wedding Shed showcased new looks across 4 of Byron Bay Weddings beautiful venues, evoking our best work to date across cocktail, ceremony and dining set-ups. Exuding a highly romantic & elegant atmosphere to relaxed dining. Soft and modern details, embellished with tints of peach, apricot, dark rose & terracotta, against a burst of black. A sunset palette is seen in splashes of rusty and burnt orange hues and is softened by light grey, white & brass gold elements. Influenced by a Tuscan romance. Gold cutlery; Jet black pillar candles in clear glass vases; Letter press stationery; Black wicker pendant lighting. Modern earthy & rustic with deep terracotta and rust on a black base. Muted greys & blue hues lighten the look, bouncing off concrete textures of warm oak timber, silver & brass elements. Repelling a suave, sophisticated appeal softened by seasonal blooms. Black pendants; Black trestle tables; Light oak cross back chairs; Large balloon wine glasses; Silver grey hemstitch napkins; Grey pillar candles in various sizes; Laguoile cutlery; Grey muslin drape. A new take on boho. Pinky peach blush tones, neutrals and mutest rust against raffia, bamboo and layered rugs. Tribal finishings, plants and a naked tipi complete the look. Layered rugs; Raffia umbrella; Bamboo bar; Congo chairs; Low Indian tables; Aztec rugs; Moroccan ottomans; Tribal bench; Large urchin pendants; Cane pot holders with plants. Fluffy cotton, natural white, deep mauve, lilac, grey & inky blue hues with hints of muted silver, ivory and woody elements. A distinct ethereal aura with a romantic woodland and whimsical fairytale feel. Influenced by byronviewfarm's gardens and natural elements. Crystal cut wine glasses; Amethyst crystals; Barnacles; Purple tumblers; White beaded chandeliers; Silver cutlery; Blush fringe napkins. Jive under the stars upon a black and white checkered dance-floor. Adorn your magical soiree in romantic hues of deep burgundy, plum and creamy white and let them pop against elements of gold and matte black. Compliment these rich colours with the earthy textures of warm oak timber, brass, marble, velvet and smokey glass. Black and white checkered dance-floor; Black timber bar, Gold framed embossed bar menu; Brass marble high bars; Charcoal lounge set; Black geometric coffee tables; Gold bar cart displaying a vintage decanter set; Black bentwood stools; Burgundy faux sheepskin. Gold arbor; Black matisse rug; Gold geo side table; White bentwood chairs. PS... I LOVE YOU red neon sign; Fairy fan lighting above dining tables; Marble look stationery in gold frames; Black and white trestle tables; Oak cross-back chairs; Crystal cut glassware; Smokey glassware; Black & white, white & gold cutlery; Blush & black fringe napkins in a knot fold; Burgundy pillar candles in skinny glass cylinders; Gold lanterns. White modular lounge set; White beaded chandeliers; Chesterfield lounge set; Linen ottoman; Pink faux sheepskin; Blush velvet ottoman; Black matisse rug; Blush, gold, ruby red, black linen cushions. Experience long banquet dining adorned in lush foliage and hints of dried botanicals. Muted neutrals to deep browns are appointed to the finer details, softening the contemporary influence of white neon lighting and big leaf installations. This look has a warm, inviting and intimate feel to it. Rattan day bed; Ibiza stools; White safari chairs; Moroccan pouffes; Cream cushions; Tropical palm prints. Edison bulb installation above banquet dining table; Natural beaded chandeliers; Large-scale foliage installation; White neon LOVERS light sign; Bamboo folding chairs; Timber charger plates; Raffia placemats; Natural hemstitch linen napkins loosely draped under plate; Coconut tealight lanterns; Decorative coconuts. Foliage on lattice arbour; Mandala rug; Natural petal signing chairs; Natural bench seats. Classic new Hamptons style in crisp whites, dove grey and inky blues. Hints of silver, natural light timber and green foliage elements are featured throughout for a contemporary influence. Rattan day bed; White moon chairs; White bongo coffee tables; Moroccan ottomans; Blue and white lattice rug; Hamptons cushion package; Cane drinks trolley; Silver decanter set; White panama stools. 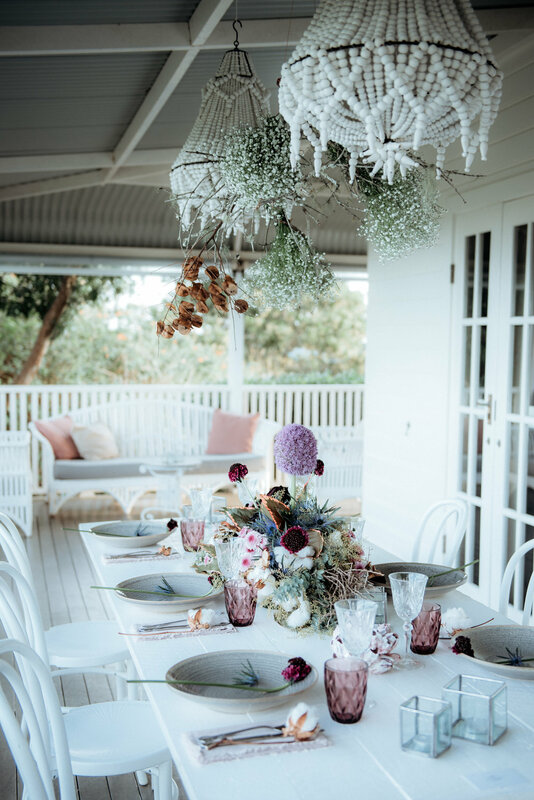 Hanging floral installation; White rustic dining tables; Bamboo pendants; Blue fringe linen napkins; Silver square lanterns in assortment of sizes; White bentwood chairs; Rattan chargers; White earthenware plates. Your wedding ceremony is the most important part of your wedding day. Setting the scene and creating a ‘special’ place with the right atmosphere to say those important words ‘I do’, can easily be brought to life through your styling. 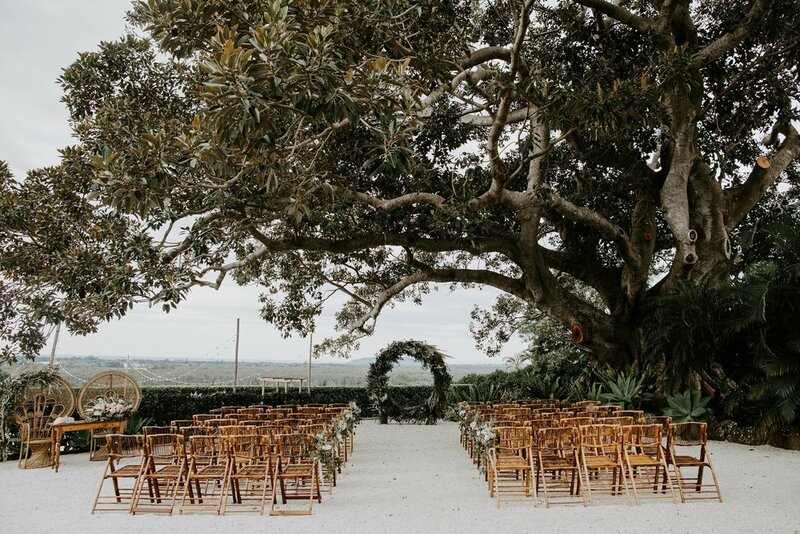 Be it barefoot at the beach, on top of a stunning hinterland hilltop vista, or underneath an ancient fig tree with ocean views, a beautifully styled ceremony can be created anywhere. Your ceremony style sets the tone and vibe for your entire day. 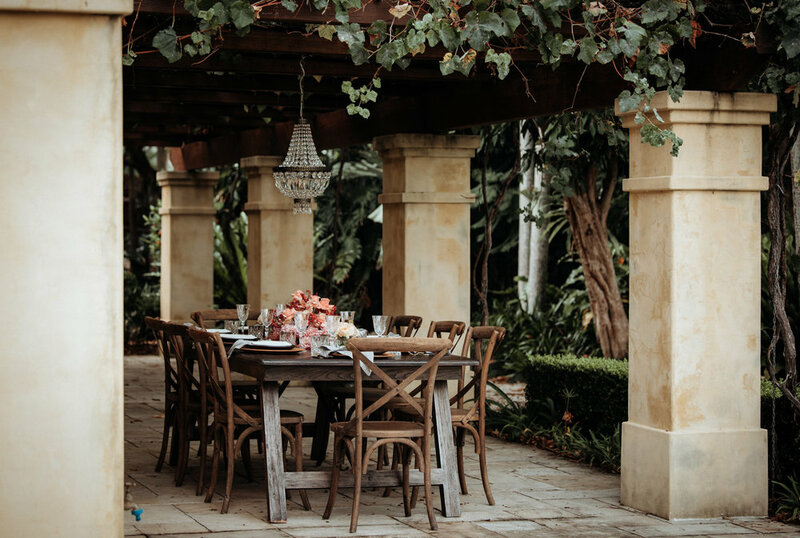 Whether you’re after a day that feels soft and romantic, elaborate and formal or relaxed and simple, the options are endless and the look and feel can be created with just a few pieces, including an arbour, chairs, floral arrangements and decorative details. For inspiration, take a look at just some of the options below. A crisp white palette with touches of soft pastel tones, elegant florals and shell details set with a simple tipi arbour can create a relaxed and romantic vibe, perfect for the boho bride. Summer ceremonies with a tropical feel can be created with lots of lush greenery and simple details such as coral, coconuts, raffia and bamboo. Light timber textures are the perfect base to add layers of green foliage, white floral details and pops of gold metallics resulting in a relaxed summery luxe vibe. A more modern rustic ceremony setting with boheme elements can be created with the use of natural greyed timber textures and deeper bold colours and earthy tones. These can be incorporated in your floral installations, layering in colourful rugs and cushions, raw timber textures and muted metallic tones and feathers. Your wedding arbour doesn't have to be the traditional arch decorated with flowers. There are an array of different style structures in all shapes, styles and colours! It can be a simple wooden arch, fabric draped from the trees, a simple tipi, screen back drop or a striking floral installation masterpiece. Take the opportunity to create something that represents you and your style. The limit really is your imagination. 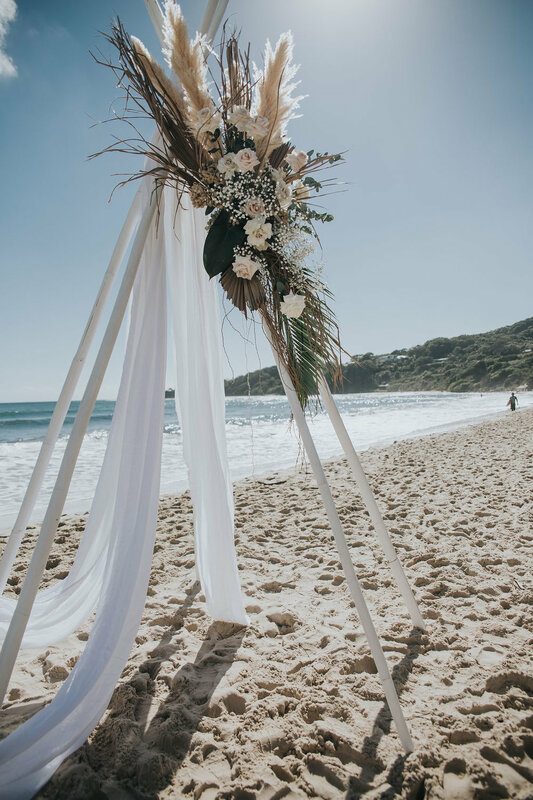 Byron Bay has its own special kind of soulful beauty and our recent styled shoot ‘Coastal Romance’ captures the iconic ocean, earth and romantic vibes that having your wedding in this region has to offer. The lush, green rolling hills that surround Byron Bay make for the perfect setting to use white decor and distinctive, colourful textures. We have expanded our range to include plenty of neutral furniture options that can really help transform a venue space and make it a breeze for styling. We’re also excited to offer these gorgeous barnacle clusters and crystals for hire. It’s these individual details and textures that really provide that extra wow factor to your wedding day. The beautiful calligraphy stationery, handwritten and designed by Cass Deller Design. The sophisticated and effortless wedding gowns by Grace Loves Lace are perfect for the modern, free-spirited bride. 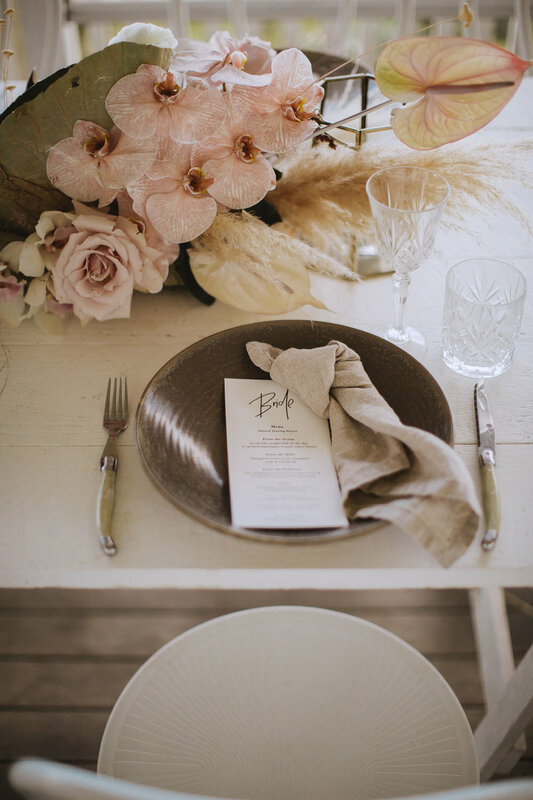 The gorgeous soft pastel, romantic florals in this styled shoot were designed by Bower Botanicals. Their creative director and one of the region’s leading floral artists, Kelley, relishes the opportunity and challenge to create something really distinctive, giving every event a unique floral edge of its own. When it comes to planning your wedding, one of the most exciting parts is deciding what the event will look like. Your table styling plays a large role in transforming the space and dictating the atmosphere of your celebration. If you don’t know where to start, we suggest in choosing a style that suits the vibe you want your day to reflect. Starting off with a natural white base provides the perfect blank canvas to began layering various textiles, florals, metallics, colours and eye-catching textures. Using a white base can also help you balance out your space and make the room look bigger. 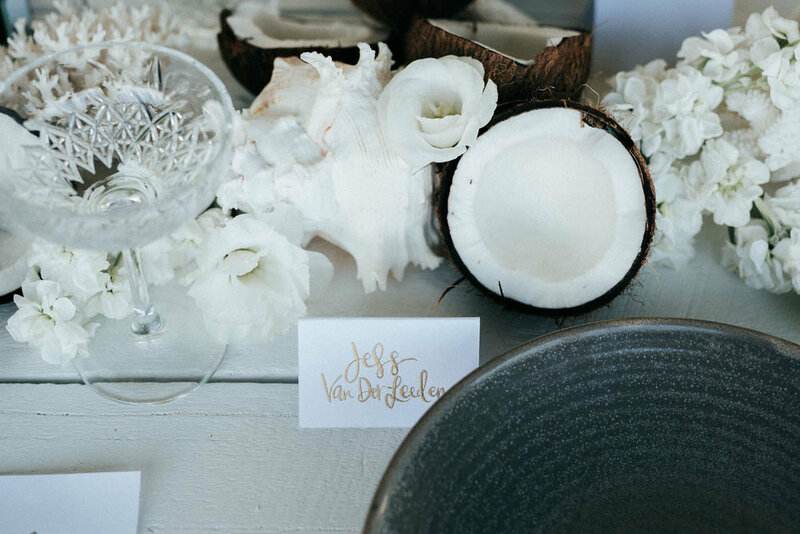 We're all for infusing a white palette with unique characteristics such as barnacles, crystals, feathers, coconuts and coral; It's the unique details against a white backdrop which really create that wow factor. Your styling choices are a way to illustrate you as a couple and add your personal touch to your celebration. Scroll down to take a look at some of our styling ideas. Monochrome can look absolutely striking and adding deep colourful florals against this look will really pop. 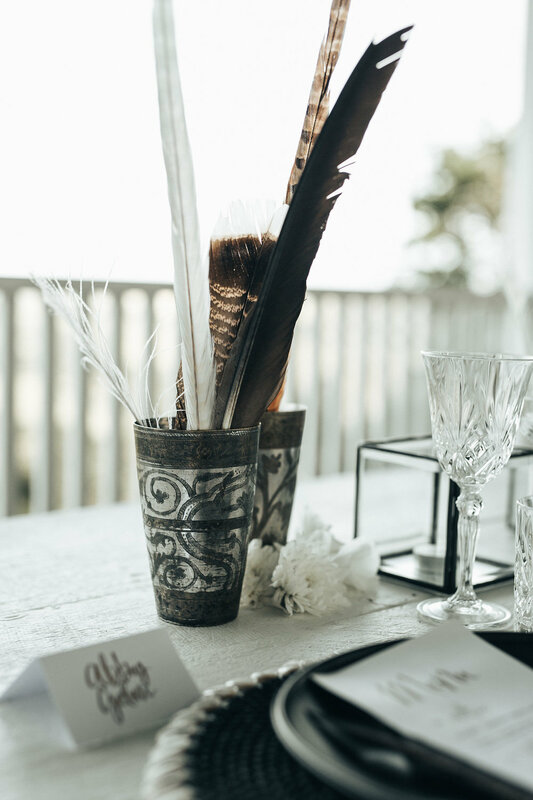 We created this look using our black plates, boho charger plates with shell details and crystal cut glassware to keep the table looking formal and sophisticated. We've added feathers for some unique texture giving it a boho vibe. This summery tropical feel absolutely boasts Byron Bay. 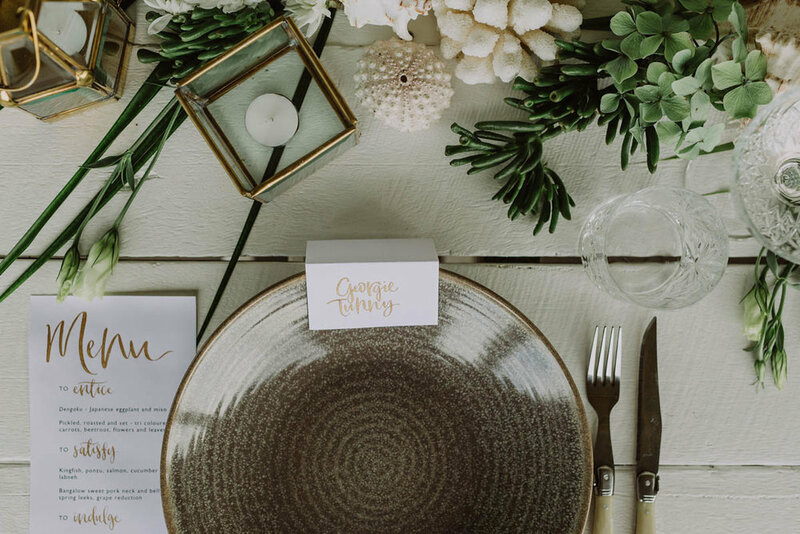 Earthy tones in the stoneware plates, mixed with palm leaves, soft florals, coral and gold lanterns is what makes up this stylish tropical look. Photos by Carly Tia Photography. 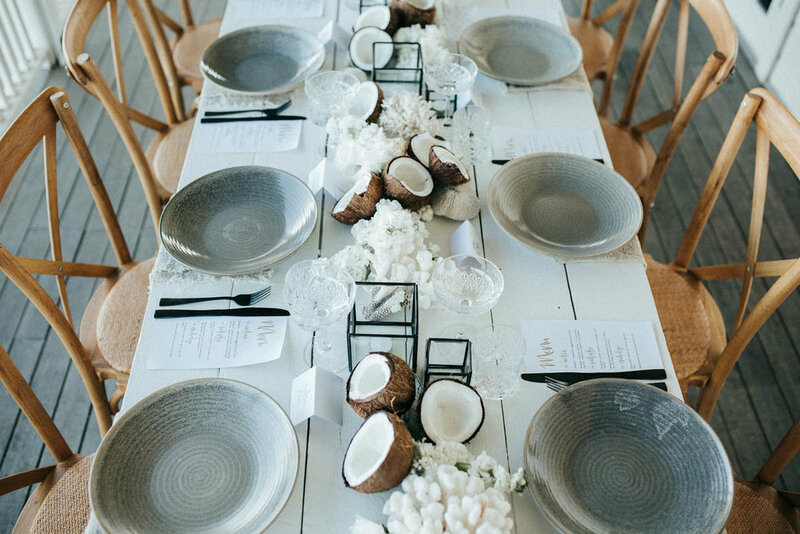 Coconuts were incorporated as the feature table piece bringing an element of a summer holiday day feel. The earthy tones of the husks, balanced with the intricate coral details and simple white florals spells tropical island paradise. The crystal cut glassware brings a touch of elegance and sparkle to the overall theme. It’s all about using organic elements, textures and a balance of monochromatic details to create this simple table setting. The hints of pink and purple pastels in the florals and decor against the white tables keep the feeling soft and romantic. The added rose quartz which symbolises the ‘crystal of love’ and barnacle clusters combined give off a luxe ocean vibe which radiates love! The feminine pastel florals and succulents by local florist, Bower Botanicals add to the unique styling of the seascape feel. 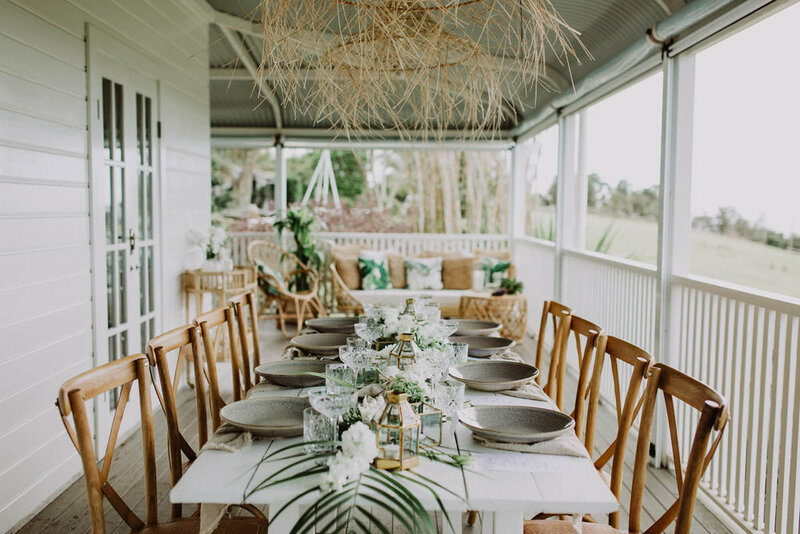 In this styled shoot we wanted to create an atmosphere of a dreamy tropical island that captures the relaxed balmy Byron vibe. Using a completely natural white palette creates a sense of serenity. 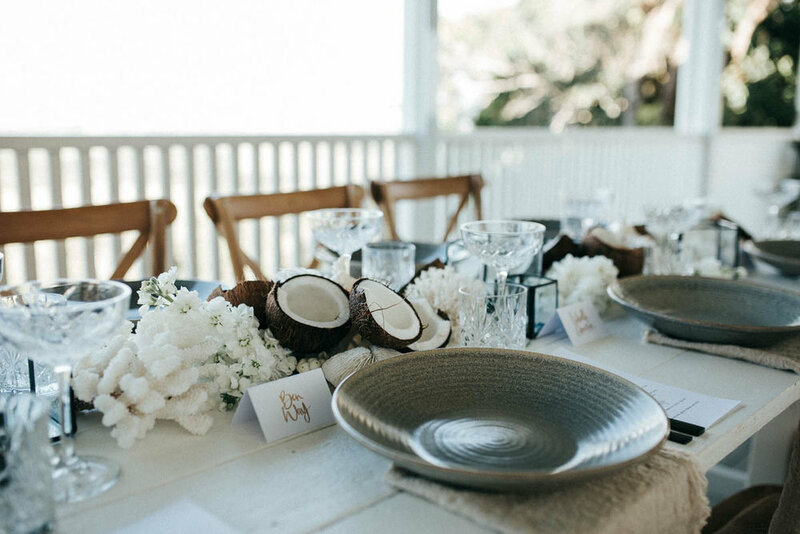 Coconuts were incorporated as the feature table piece bringing an element of summer and fun. The earthy tones of the husks, balanced with the intricate coral details and simple white florals spells tropical island paradise. The crystal cut glassware brings a touch of elegance and sparkle to the overall theme. 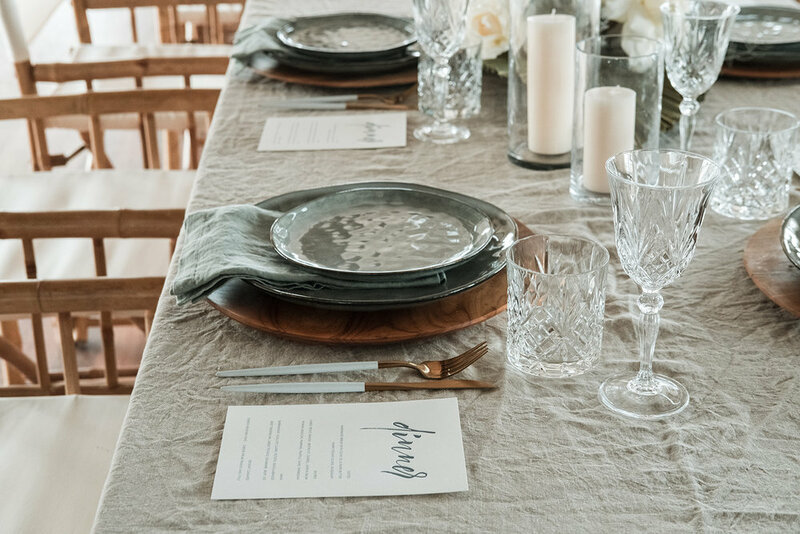 It’s all about using organic elements, textures and a balance of monochromatic details to create this simple table setting. Keeping the details not too perfectly organised keeps the feeling relaxed and carefree; which is what we’re all about in Byron. 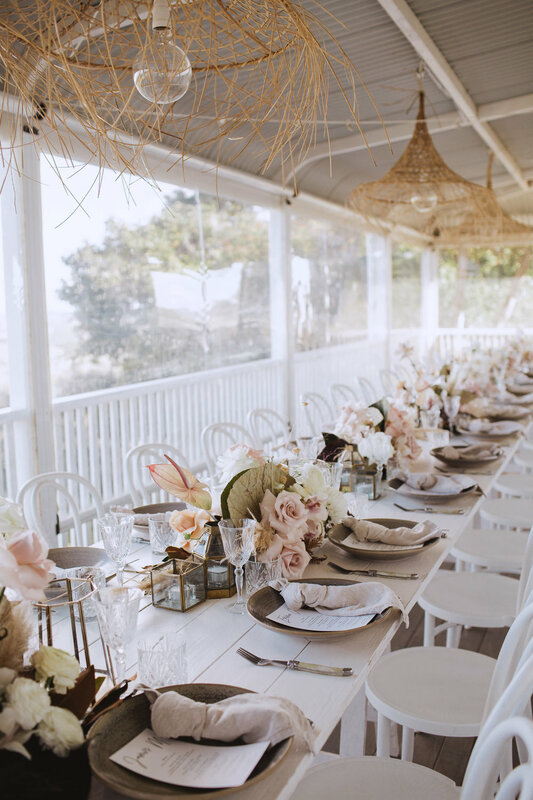 Our new range of white tables and neutral furniture provide the perfect blank canvas for adding unique characteristics to your overall wedding styling. With a few details you can completely transform your space to feel like your ultimate getaway location or special place. Remember whatever styling, theme or decor you choose is a way to illustrate you as a couple and add your personal touch to your celebration. We love creating gorgeously executed spaces, and for something a little different we recently had the pleasure, along with The Event Shed to style something special for a gushing mother to be. 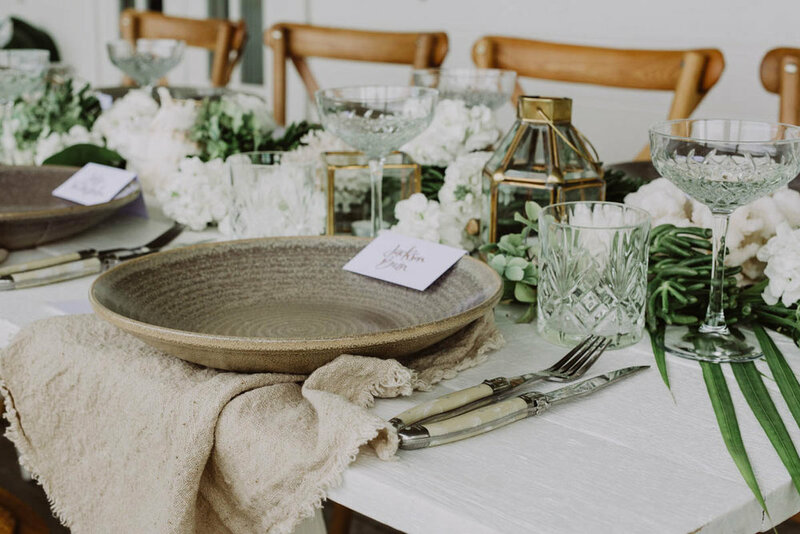 This baby shower was styled with pieces from our range of furniture & decor (all available for hire), along with beautiful ferns by Wilderness Flowers. Ferns bring a lush, soft, classic feel and can easily transform your table, room, bouquet or food platter to look absolutely striking. You can apply them to almost any theme, and they're one of the simplest ways to add a wow factor to your wedding or event. The luscious food was supplied by Feast Events who specialise in relaxed dining such as feasting tables and food stations. The scrumptious cakes and desserts were supplied by Millie's of Newrybar. Dione is a passionate cake designer who loves creating elegant, beautiful and mouth-watering cakes, desserts, biscuits & preserves for special occasions. Creating a beautiful looking space for any event can be really simple. The Event Shed can help plan these unique occasions from looking after your catering needs to furniture hire so you can celebrate important times of your life with ease and in style. Photographer: Stories by Ash, Location: The Fig Tree Restaurant, Florist: Wilderness Flowers. Catering: Feast Events & Millie's of Newrybar. Styling: The Wedding Shed and The Grove Styling. Arbors – With a range of arbors these days – your wedding style and venue will determine whether you choose a rustic drift wood arbour, a more traditional classic hardwood arbor or even a sophisticated lattice screen arbor. Floral options for your dress arbor can range from full cascading blooms which creates a stunning vision to a more understated colourful statement on one corner. Seating – Select from a range of seating styles such as matching chairs to more informal garden wedding style seating. 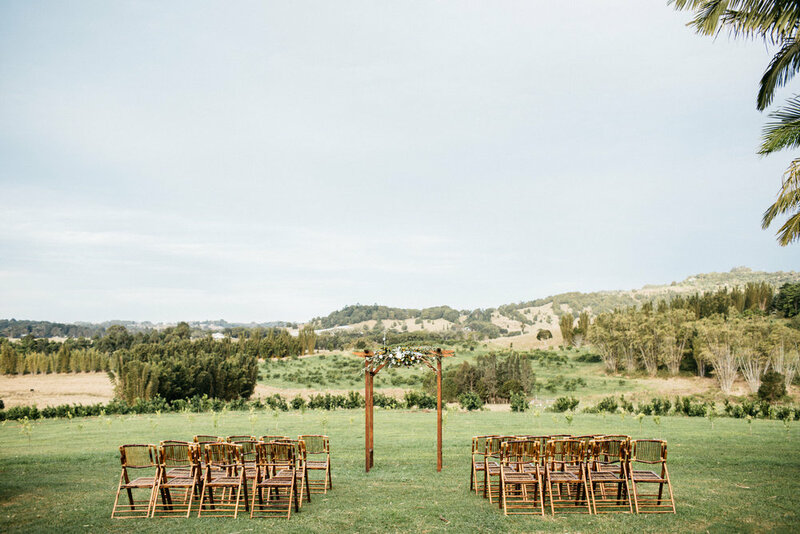 Consider how many older guests you have coming and the length of your ceremony - will they need chair backs for comfort. It’s also possible to mix and match chairs and benches for a more informal look. 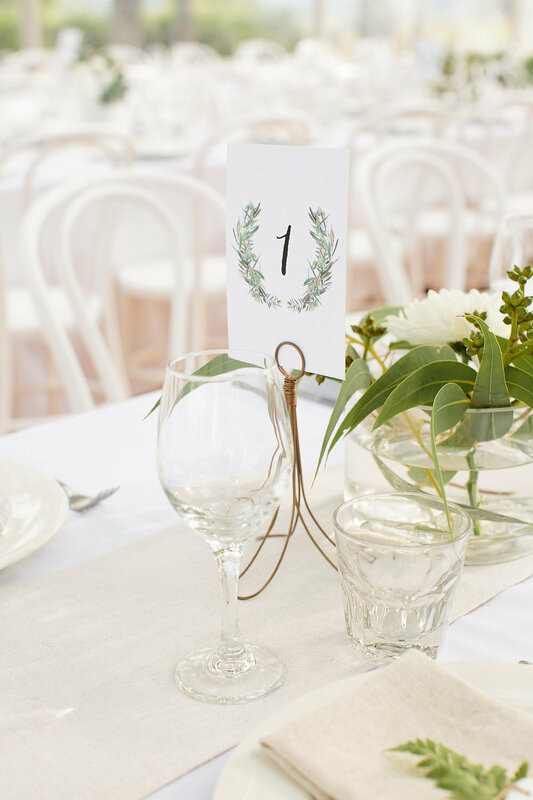 Decoration – seating decoration can vary from a floral bouquet at the end of each row (or every second row of chairs). For a more rustic, country charm style consider tying floral bouquets to the end chairs with raw jute twine or shepherd's hooks. For a more classic look, floral garlands along the ground the length of the chair rows creates a stunning natural ‘aisle’ for the bride to walk down. Rugs & Aisle Runners – another option to create an aisle are carpet runners. The cow hide is a perfect statement runner which will add a touch of glamour to your overall look. If you’re after a more relaxed vibe, a Moroccan runner give the perfect shabby chic feel to any wedding. If you are wanting to create a warm comforting space look at layering afghan rugs bringing home away from home to your ceremony. Signing Chairs – signing your wedding certificate deserves to be done in style. For a sophisticated statement style consider chairs the White Peacock Signing chairs or for a more relaxed boho look the Natural Peacock chairs are a great choice. For the classic look, the White Colonial high back chairs are a great choice. Your signing chairs can then be reused at your reception feast. Add some individual Mr & Mrs signs for some more detail. Signing Table – a range of signing tables is available whether you are after the more classic garden style or chic look. Consider the size of the signing table, do you want any additional floral decoration on it such or will you simply display your bridal bouquet on the table. As with the signing chairs, the signing table can be reused as the cake table later. See below for some options. On a perfect summer’s day, the lovely Steph and Liam exchanged their vows at the Fig Tree under a beautiful floral drenched arbor with the ocean glistening in the background. Guests enjoyed canapés in the gardens under the canopy of the 100-year old fig tree while enjoying views to the ocean and hinterland before dining banquet style under the stars. The French Petal’s stunning blooms created beautiful summer vibrancy throughout the evening and complemented Steph’s gorgeous vintage inspired Anna Campbell bridal gown perfectly. Many thanks to Stories by Ash for the amazing photography. Huge congratulations to Steph and Liam and big thanks for letting us be part of their special day. 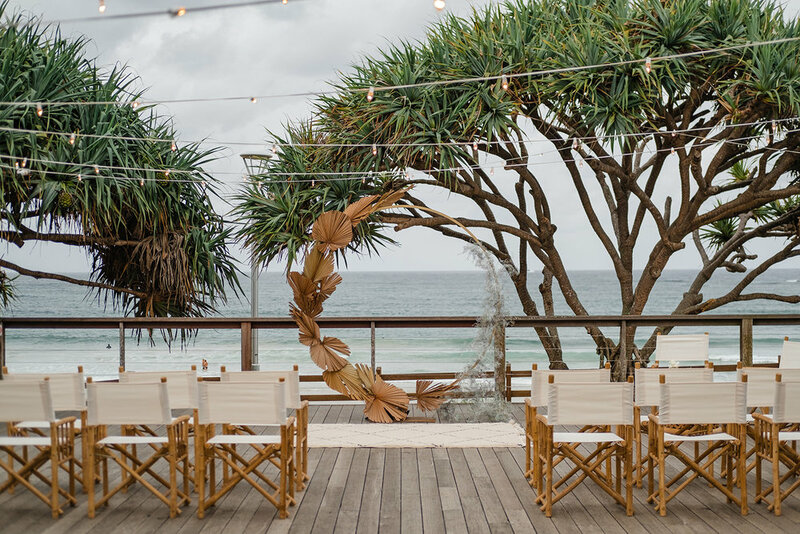 The lovely Stacey & Glenn recently wed at Fig Tree Restaurant in the company of close friends and family beneath the properties 100-year-old fig tree with vistas of the ocean, countryside and Byron Bay. The French Petal worked her magic to create an incredible floral arbor, meticulous floral installations that guests dined beneath within the restaurant and Stacey’s gorgeous floral crown of deep red and pink blooms. 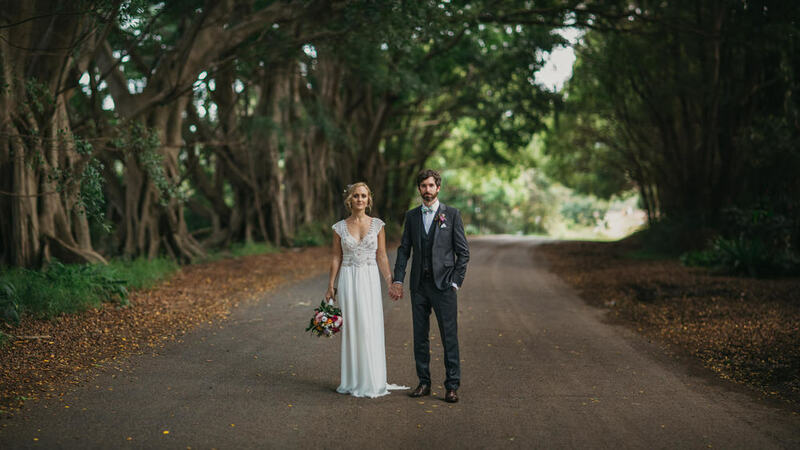 The winner for us was most definitely Stacey’s gorgeous two-piece Bo & Luca gown from the intricate beadwork to the soft draping fabric – the day was nothing short of perfect. Once again, Congratulations Stacey & Glenn, thank you for letting us be apart of your very special day. 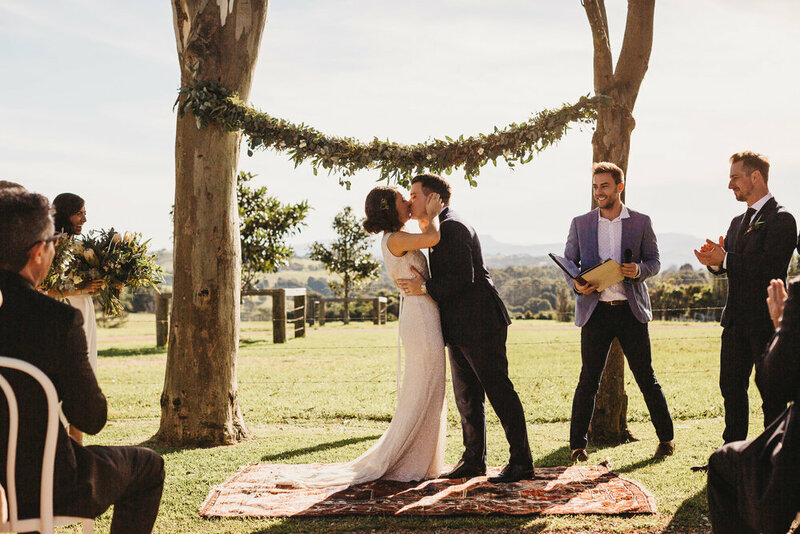 Gracefully set on a high hill overlooking the lush Byron Bay hinterland, complete with its own macadamia plantation, The Grove set the stage Amy and Myles’ spectacular wedding. 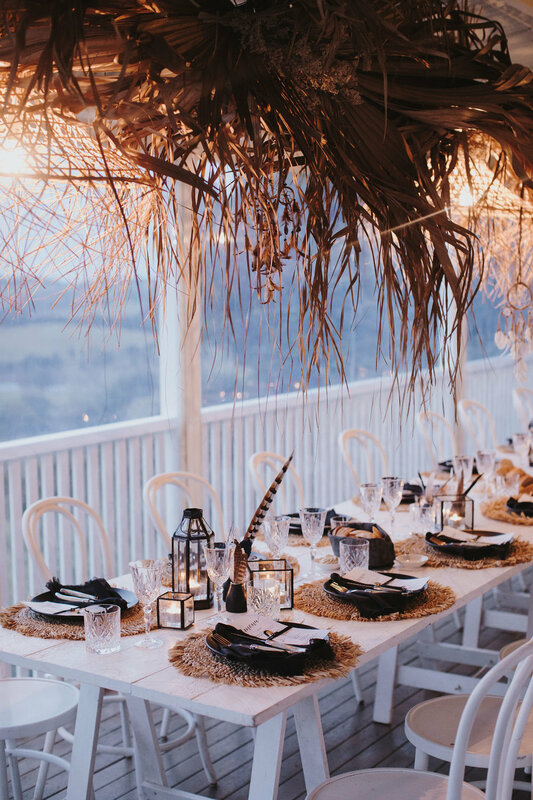 The couple living abroad, enlisted in the styling and design services of The Wedding Shed to flawlessly execute their rainforest submersed wedding. Amy was adamant that there was not a single flower at the wedding; instead an all green affair was created! Over 70 square metres of lush tropical rainforest were installed in three Nordic tipis, rich greenery and relaxed natural cocktail areas were arranged around The Grove. A smaller tipi was transformed into a ‘pop up bar’ offering the perfect chill zone for guests to kick back relax and enjoy a cocktail. Many thanks to John Benavente for shooting this show stopping event & huge congratulations to Amy & Myles.